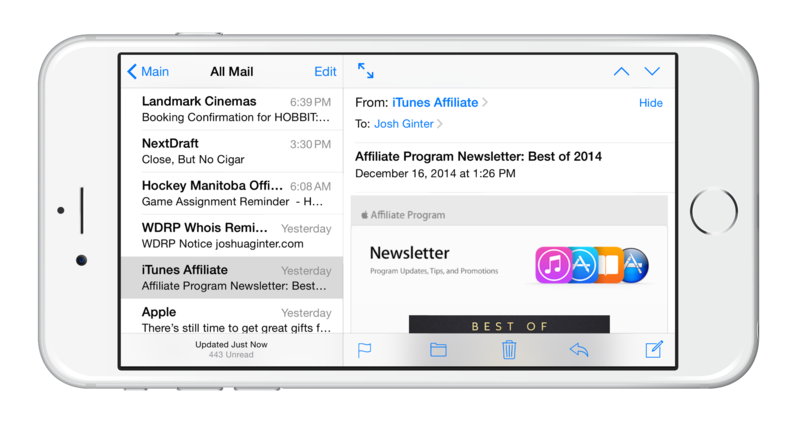 I was wondering if there was a way to make the MasterDetailPage replicate something like the iPhone's native Mail app (seen below). From what I've read, the iOS implementation of MasterDetailPage is based upon the UISplitViewController. Is there a way to possibly use platform-specific code to access the underlying UISplitViewController? On my iPad, the master detail view is always in split mode. Don't have a 6+ to test with. The Detail of a MasterDetail page can most definitely be a navigation page. Yes, it splits on iPad. However, in Xcode, the default check is to see if the screen width exceeds a certain threshold (which the iPhone 6+ does in landscape) and it also displays the split mode then. I'm aware that the Detail can contain a NavigationPage, but I got errors when trying to nest a NavigationPage in the Master. the master is just a popout menu. you can't do any navigation on it. As originally stated, I'd read a Xamarin dev state that the MasterDetailPage is based on a UISplitViewController on iOS. In iOS, each view can have its own NavigationController (like the Mail app). Or has anyone (or would it even be possible to) made a custom, third-party Xamarin.Forms Page-type based on UISplitViewController that would allow this?